You can meet Kurren inside Hadret House in Brackenbury (#1). When you first arrive in Defiance Bay, he won't have much to say to you, but after triggering the quest The Hermit of Hadret House, he'll be freer with information, and he'll give you this quest. Elcga in Brackenbury (#2). She'll tell you that before her friend Kendal went missing, he starting hanging out with an acting troupe, including a woman with "long, willowy legs and slender arms." Lora in Copperlane (#5). She'll tell you that before her sister Kora went missing, she had just landed a role with an acting troupe called the Revel of Stars. Oly in Ondra's Gift (inside the Salty Mast, at a table near the entrance). You'll need to convince him to talk, which will require you to have 10 cp, Constitution 14, Might 13, or Resolve 11. Oly will then tell you that the last time he saw his drinking buddy Lendry, he had just met "a real fancy lady" named Lumdala, and they were heading out to see a performance at the amphitheater in Copperlane (#3). After talking to all three witnesses, you'll notice the similarities in their stories, and you'll decide to talk to Lumdala at the amphitheater in Copperlane (#3). When you get there, Lumdala will claim that she barely knows -- if she knows at all -- any of the three people. However, at the end of the conversation, a spectator named Kadal will whisper to you that he knows what's going on, and that you should meet him in Lumdala's house. Inside Lumdala's house (#4), Kadal won't really tell you anything, but he'll give you a Rusty Bronze Key, which will allow you to open a nearby door. Beyond the door you'll find a staircase leading down into a secret part of the Copperlane Catacombs where you'll discover a theater. Inside the theater, you'll find a scarf on the floor. When you examine it, you'll sense Kora's soul, and communing with it will show you how Kora was murdered while performing on stage. At the end of your vision, Lumdala will show up with her acting troupe, and she'll try to make you a deal. She'll offer to tell you the name of the man who finances the performances provided you let her go. If you agree to the deal, then she'll tell you that her patron is Lord Gaderman in Brackenbury. You'll have three ways you can deal with Lumdala: you can refuse her deal or simply attack her when she shows up, you can accept her deal to learn about Gaderman but then attack her anyway, or you can accept her deal and let her go. As far as the quest is concerned, the only thing that matters is if you learn about Gaderman or not. Lumdala will disappear from the game regardless. But note: if you kill Lumdala, she'll drop a Ring of Protection. You can demand money from him, or you can let him go. He'll pay you 1000 cp. You can demand a scapegoat. He'll give you Linete's Signet Ring so you can frame Linete Reymont, and he'll also give you 1000 cp. 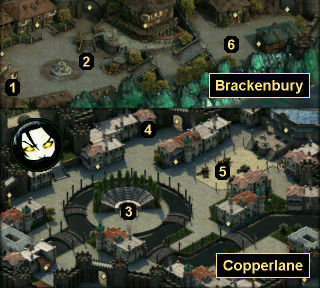 Linete will then end up in the sanitarium in Brackenbury. You can announce that you're going to turn him in. This will cause him to take some poison and kill himself. To complete the quest, you'll just need to return to Kurren so you can tell him what you learned during your investigation. You'll have up to three possible murderers that you can name (Lumdala, Gaderman, Linete), plus Kadal. But it won't make any difference what you say. Regardless, Kurren will reward you with 3000 cp, and you'll earn a "moderate" amount of reputation with Defiance Bay. If you demand more money, then Kurren will throw in an extra 1000 cp. If you tell Kurren that he can keep the reward, then you'll lose the 3000 cp, but you'll earn a "major" reputation bonus with Defiance Bay instead of the "moderate" one.